Just a minute ago I found out this mode is replacing Singleton in a few days. Not as much as I enjoy Singleton, no. 600 gold to enter, 100 gold reward? I don't think I'll be playing at all. I'm guessing they are trying to count the value of the booster as a winning value so that would come to 1100 for two wins actually. Yeah, no. Maybe if it doesn't get enough support they'll stop trying to value pack rewards so highly. A booster isn't worth 1000 gold. 1000 gold can be used to enter e.g. a draft, boosters cannot. If the rewards were, e.g., 600g to enter 1000g for 2 wins - then even though it's strictly speaking less than the current rewards, it'd be something I can think about playing. With 2 wins, you are making profit. But what, if your deck slips and you go 1-1? Then you paid 500g for an uncommon. The risk vs reward for this event is to high. On top of that I totally dislike the concept. Singleton is great on the other hand. Not interested in these weekend events at all really. The entry/reward layout is pretty underwhelming, the numbers of games you get for that exorbitant entry is pitiful, and none of them will stick around long enough (is there seriously any reason they can't at least run a whole week?) to make crafting cards or brewing anything specific worthwhile. Exploration M19 draft looks intriguing at least, it's the only format they didn't go out of their way to muck up. I can see myself trying it out with a land destruction deck. If you've got the land, you can start blowing them up with all the 4cc LD spells. I tried it in standard and won a few games, who knows it could be good. Wonder if I'll trouble finding an opponent. Well, I did it and tried it out. I'm at 1-1 ATM with a pretty janky gruul LD deck. I actually missed the 9 card opening hand aspect of exploration, but LD works pretty well against multi-colored decks. I faced an esper scarab deck (my loss) that dropped an early bug that I don't really have answers for and countered most of stuff, but I killed all his blue lands and almost turned the game around, but he had a hand full of black removal and my life total was just too low at that point. The other game was against dimir hand destruction which opened with T1 double duress (that took Chandra and Jaya), but again I killed his blue lands and he didn't draw too many more, he did drop a torment of scarabs that put a lot of pressure on me, but a top-decked multani came to my rescue and I narrowly won with 2 life. I had some fun with Mono Blue Storm in it last night; won both of the times I tried before going to sleep. Though I dunno about continuing to play any more. Hey exploration is actually a lot of fun! Or maybe it's LD that's fun! Anyway, I went 1-2 on my first run, made some changes (cut all the mana dorks and went with more burn/sweepers and more lands)and 2-1 on my second go. Beat a turbo fog/nexus deck that never got 2 blue mana all game long... That was sweet! You see, LD actually works because you still only draw 1 card per turn and lots of people are playing greedy 3+ colour decks. 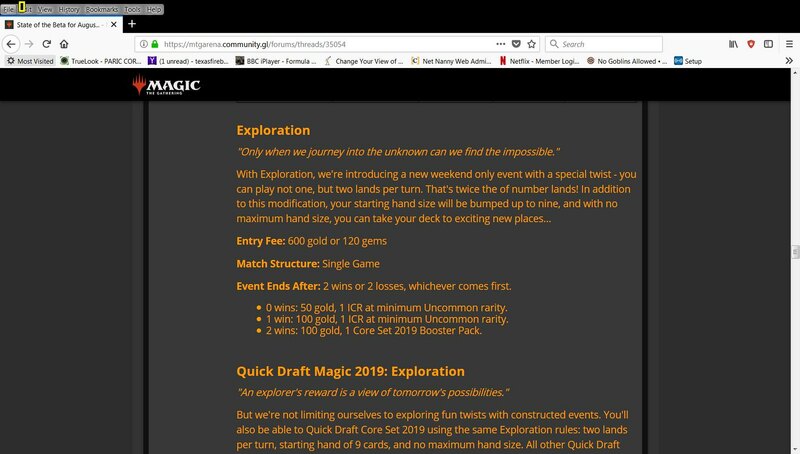 Anyone try the Exploration Quick Draft? I'm thinking about it. Might be very interesting with the ramp and hand size. I'm gonna try it out tomorrow, think I'll go overboard on bombs. 4-drops on T2 should be brutal. Pretty fun and definitely better to think 4 drops and beyond and forget more aggressive looking low drops. Yeah, I enjoyed it. Went 4-3 with a boros deck that was pretty good bomb-wise, but with precious little removal. It seems like boros was really popular because I faced at least 4 other boros decks.